NFL 'Deflategate' Saga Continues With Both Sides Back In Federal Court : The Two-Way NFL Commissioner Roger Goodell and New England Patriots star Tom Brady were in court today to update a judge on settlement talks regarding the quarterback's four-game suspension. 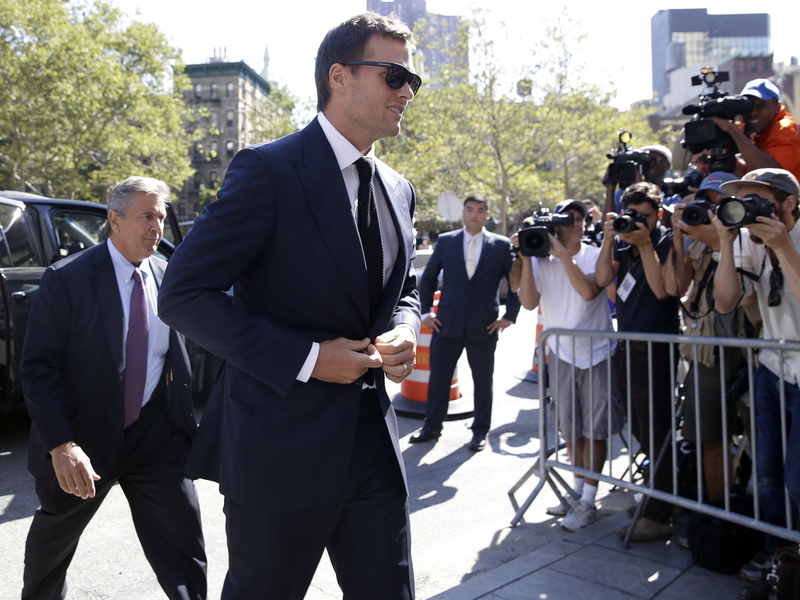 New England Patriots quarterback Tom Brady arrives at federal court in New York on Wednesday. New England Patriots quarterback Tom Brady and the NFL appeared in a Manhattan court today to update a federal judge on whether both sides are any closer to resolving a dispute over the quarterback's pending four-game "deflategate" suspension. The public portion of the hearing lasted approximately 80 minutes before U.S. Judge Richard Berman met separately with Brady and league officials in private. Neither Brady nor NFL Commissioner Roger Goodell spoke during the proceedings except to introduce themselves to the judge. The judge pressed the NFL's lawyer on the strength of the evidence in the league's case linking the four-time Super Bowl champion to the scheme to deflate footballs, according to reports. The Patriots open their preseason Thursday against the Green Bay Packers. And NFL.com reports Brady is unlikely to play. Berman has encouraged both the league and the NFL players union to come to a consensus on punishment, so the court does not have to decide whether to uphold the four-time Super Bowl champion's four-game suspension. "Judge Berman becomes the key figure. He'll be the one steering the settlement conversations, and asking both sides questions with the intent to reach a common ground." An investigation earlier this year determined Brady was aware of a scheme to deflate footballs below the league's standard during a playoff game in January. As the Two-Way has reported, Brady received the four-game suspension in May and the punishment was upheld last month, with Goodell saying that Brady had "engaged in conduct detrimental to the integrity of, and public confidence in, the game of professional football." "The league says the Patriots were deflating game footballs to give the quarterback an edge. That's why the franchise has to cough up two draft picks and pay a $1 million fine. Tom Brady has to sit out four games without pay. Many fans here think that punishment is too strong." Both sides have asked for the judge to make a decision by Sept. 4 if a settlement cannot be reached before then. That's six days before the Patriots' season opener against the Pittsburgh Steelers.